Get to know Pete Nelson's family, the Treehouse Masters, the Nelson Treehouse and Supply staff, and the crew's pets! Pete fell in love with treehouses as a child, after building a backyard treefort with his dad at their home in New Jersey. With his treehouse design and build firm, Nelson Treehouse and Supply, Pete has created hundreds of treehouses around the world. Pete has also published six books on the art and science of treehouse-building, most recently Be in a Treehouse, and has shared many of his builds with global audiences as the star of the hit Animal Planet television series Treehouse Masters. In all of these projects, Pete has endeavored to equip others with the information and inspiration to get out into nature and up in the trees in a safe, sustainable, and fun way. 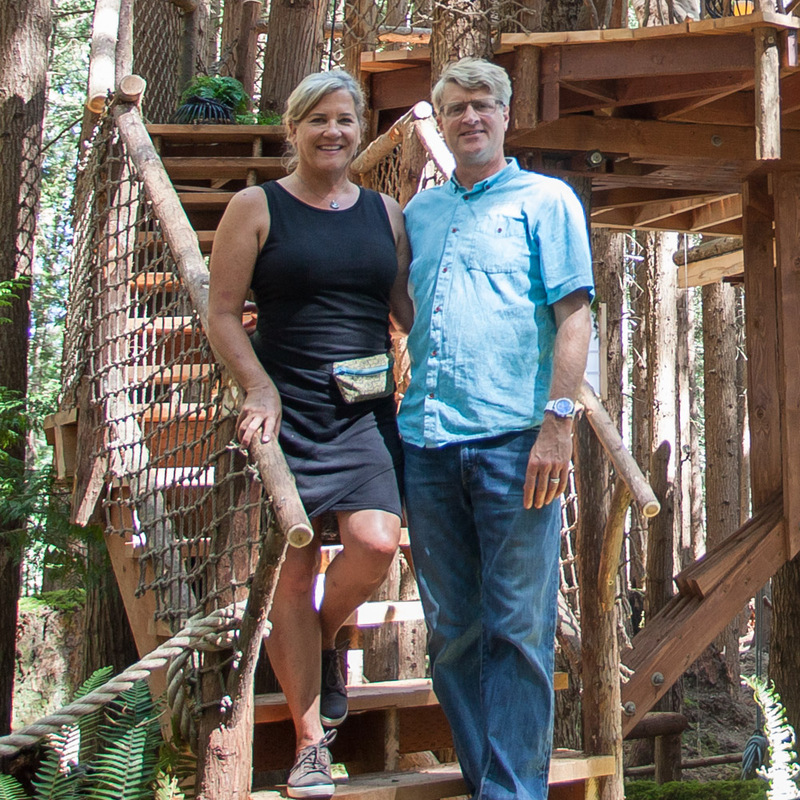 In 2006, Pete and his wife, Judy, opened TreeHouse Point, their world-renowned retreat in Fall City, Washington. In 2018, Pete opened his second treehouse retreat—this time in Utopia, Texas, in partnership with restaurateur Laurel Waters. Pete and his team are currently working on Treehouse Resort and Spa in Redmond, Washington. Pete and Judy live in Washington and enjoy working with their three adult kids–Emily, Henry, and Charlie–and their son-in-law, Patrick, on all things treehouse. The couple welcomed their first grandchild, Douglas, to the treehouse life in January 2019! The love of treehouses must be contagious because Judy gets as excited about the arboreal structures as the rest of her family does. When she's not busy running Treehouse Point (with the help of an incredible staff!) Judy loves to cook, play soccer, hike, and drink tequila with her friends. She married Pete over 27 years ago and is an excellent mom to their three fantastic kids, three dogs, a large cat and a bunch of chickens. Judy and Pete welcomed their first grandchild, Douglas, to the treehouse life in January 2019! After being refined at various educational institutions for the past few years, Henry, twin of Charlie, is has officially busted onto the treehouse scene! A key member of the travel team, and a night crew regular, Henry is quickly mastering building in the trees. Tasked with building all of the compostable toilets used in the treehouses, he is known for his signature Hank Tanks. When Henry is not busy swinging a hammer you can probably find him hucking a Frisbee out in the backyard, or sporting a backpack and exploring the great Pacific Northwest. Read Henry's Staff Spotlight here. Emily received her Bachelor’s in Sociology with honors from the University of Washington. She brings years of experience in business management and administration, partnership development, marketing, and online commerce. Emily oversees operations of Nelson Treehouse projects and personnel, and facilitates partnerships and planning for Treehouse Resort and Spa. She also founded and leads our online store for treehouse hardware, supplies, and lifestyle products. When Emily isn't running all things related to the family business, she can often be found chatting loudly with Pete on her parents' front porch with her dog, ToastyRoastyMunchyBun, and her husband, Patrick Willse. Emily and Patrick welcomed their son, Douglas, to the treehouse life in January 2019! 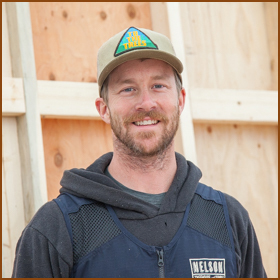 Born into the world of treehouses, Charlie is Pete Nelson's son and one of the carpenters on our build crew. Growing up in, among, and dangling from trees, Charlie has enjoyed this unique perspective, and thoroughly appreciates the effect treehouses have on the trees and on the people who interact with them. He has accumulated a broad set of treehouse building skills that he looks forward to passing on to future generations of treehouse builders, just as previous craftsmen have done with him. A trained guitar builder, he is also a recent graduate of a boat building program in Seattle. Daryl was born in New England, then moved west with his family at the age of 10. Growing up with a father who was a contractor, Daryl has been around building all of his life. While attending the University of Washington, Daryl met Pete through a mutual friend. The rest is history; over 200 treehouses in over 6 countries later, Daryl lives and breathes treehouses. He also enjoys outdoor activities like snowboarding, mountain biking, and hiking with his wife Nicola (who he met at treehouse workshop! ), and their faithful dog Rusty. Read Daryl's Staff Spotlight here. Chuck was born in the year of the monkey, which may explain his love of being in the trees. It started at an early age, in the back yard of his Boston childhood home. The love of building has been a preoccupation, and an occupation, for most of his life. Chuck has been a General Contractor in Seattle since the late 1980's, but has worked on projects all over the country and around the world. His delightful partner Teri Fox, convinced Pete to hire Chuck in 2008. Since then, he has been growing younger by the week working with the Nelson crew. Read Chuck's Staff Spotlight here. Toby was introduced to woodworking at a young age in his father's shop and has been following that path in various forms ever since. He brings 25 years of building experience to Nelson Treehouse and Supply. Toby shares a love of gardening and the outdoors with his wife, Jennifer, and is kept on his toes by his son, Arrow, and daughter, June. Neko, Toby's trusty dog, often accompanies Toby to work. Read Toby's Staff Spotlight here. Daniel received his Bachelor’s in Architecture with honors from Auburn University. He brings a decade of experience in both small-space, vernacular design/build and long-term, large-scale design projects like apartment buildings and high-rises. Metropolis, and Portfolio Design: Fourth Edition. Daniel began his Nelson Treehouse journey as an intern in 2006. When he’s away from his desk, Daniel makes furniture and art, cooks, spends an irresponsible amount of time outside, and hangs with his brilliant wife, Sandy, and grumpy hedgehog, Frenchy. Read Daniel's Staff Spotlight here. After 20 years of “ground house” building, Scott has decided to take it to the trees! Born and raised not far from Fall City, WA, his childhood days were spent in the woods constructing forts, rope swings, and hideouts. Now many years later, he is feeling young again at Nelson Treehouse! As the son of an engineer, Scott is always looking for a creative way to find solutions. As a teenager, Scott's wife, Robyn, helped care for and teach the Nelson kids, so things have truly come full circle. In his spare time, Scott can be found dodging the trees on his skis or backpacking among them with his son, Cedar. Read Scott’s Staff Spotlight here. Charlie Spitzack grew up building tree houses in the woods of Minnesota. During his heyday, there were 5 scattered around his childhood home. The last one fell down on his 18th birthday, and for a long while he wandered the world a bit dazed and confused, until he found Nelson's Tree House & Supply and started building them again. Read Charlie's Staff Spotlight here. Patrick hails from tropical Cleveland, Ohio, and brings years of construction experience to the NT&S team. Patrick's first construction job entailed transforming a tired old building in his hometown of Rocky River into an artful brew pub. He went on to build skate ramps and run his own residential construction business specializing in outdoor living spaces. Patrick got hooked on the treehouse life by building a treehouse for his nieces and nephews. After meeting Pete at a local treehouse build in Ohio, Patrick relocated to the Pacific Northwest and joined the NT&S team. The company has brought Patrick more than a dream job: it also brought him to Emily, his now-wife! Patrick and Emily welcomed their son, Douglas, to the treehouse life in January 2019! Travis is a Pennsylvania born guy with over ten years of experience building in the trades, primarily as a finish carpenter. An avid hiker and adventurer, Travis has swung a hammer from one pole to the other - the North Slope of Alaska to Antarctica. He is also a Reefnet Fishing Captain on Lummi Island, Washington - a traditional Puget Sound Fishery for salmon. With a particular interest in small space design in trees, on wheels, or ground, Travis relishes a creative building challenge. He is also a novice juggler. All the way from Massachusetts, Geoff Ayr joined Be in a Tree as the head of the shipping department. With his flowing locks and ever-evolving facial hair, he knows how to have a good time - in and out of the office. A professional mountain biker, Geoff has traveled all over the country competing in some of the gnarliest bike races. Not only that, but he has a knack for playing in the dirt and building the courses he rides! 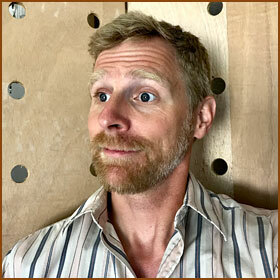 A budding carpenter and eager treehouse truck driver, Geoff has quickly become an integral part of the team. After finishing school in North Carolina, Dylan drifted to the west coast where he joined forces with the Nelson crew. Since then he's been roaming the country with a tool belt and an upbeat attitude, living the happy life of a treehouser. Thanks to his previous experiences in technical theater and doing mechanical fabrication, Dylan approaches treehouse building with powerfully creative perspective. Also, he can move things with his mind. Read Dylan's Staff Spotlight here. Rolf is a Swiss-born, southern-scribed migrant who has set seed in the cedar forests of the NW and is pursuing the crafts of wood. Rolf is happiest spending time with his family, drawing, sawing, milling wood and building. These labors keep him breathing with a smile. Son of a sailor, Hayden was born into a life of tiny, well-crafted spaces. Inspired by childhood books like Tarzan and The Swiss Family Robinson, he wasn't conditioned for a conventional career, but was instead fascinated by the natural wonders. After graduating in engineering, Hayden pursued a professional maritime career, but realized he preferred the simple life and retreated to the mountains of North Carolina. There, he has spent a decade homesteading and building custom mountain homes with a local contractor. Hayden's favorite style is rustic mountain craft with yacht-quality finish, which fits right in with Nelson Treehouse! Kevin has always loved building forts and treehouses, and more recently has been captivated by tiny homes; he lived in a 140-square-foot tiny home with four cats and a dog before upgrading to the 350 square-foot tiny home he lives in now. Kevin appreciates how living in small spaces requires residents to remove excess stuff, focus on the important aspects of a home, and reconnect with the natural world around them. 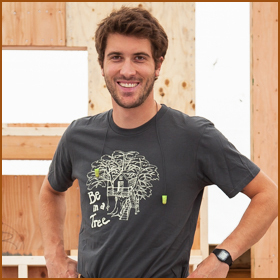 With his love of small space design/build, working on treehouses was a natural fit! Kevin brings experience in foundation work, treehouse building, and tiny house remodeling to the NTS team. Kevin's hobbies include making furniture, whittling, farming and homesteading, small-space Feng Shui, rock climbing, and raising his dog, Koda, and two cats, Phoenix and Ned. Another fun fact about Kevin: he's lived without electricity for three years and loves it! Aaron has called Washington State his home for 42 years - a good run by any standard. He's been a stage and commercial actor, and has traveled the country building pedestrian suspension bridges. When not building treehouses, you might find Aaron helping his friends move or repairing his comically fragile Volkswagen Vanagon. Aaron doesn't own any pets, is homeless, and is tragically single. Originally from Indiana, Seanix now lives in rural New Jersey with his wife, Camille; son, Hagan; daughter, Sloane; and bunny, Walnut. Seanix is currently surveying his acreage for the perfect trees to fill with nets, bridges, and platforms. When he's not away on treehouse builds, Seanix enjoys family, friends, food, outdoors, making music and tying them all together with a fire in the backyard. If irritable, Seanix can be calmed by unraveling a tangled mess of rope. Read Seanix' Staff Spotlight here. Adam joined our team after taking a three year (non)vacation building cell phone towers in Hawaii. Needless to say, Adam is not afraid of heights. An expert climber and exclusive member of Brothers Cage (members being John and Adam) he has quickly become a key asset of our travel team. A skilled pool player, Adam enjoys finding the local pool hall near all of our builds to play locals and dazzle them with his mad skills and sultry smile. Jake wants you to know that he can “seriously do anything.” That’s a pretty accurate statement, seeing as he does everything from leading tours at TreeHouse Point, to packing orders for our treehouse supplies store, to hauling lumber and driving forklifts. Jake grew up near our treehouse HQ and moved to Colorado to study at CU Boulder (and sharpen his talents on the ski slopes). Jake's happy to be back in the PNW and, when he’s not doing anything and everything for work, he can be found skiing, golfing, and playing softball. Ian Franks' most memorable childhood moments were spent building forts on his family's wooded lot just 15 miles from Fall City. Following his schooling at Evergreen State in 2003, Ian decided he'd be happiest working with his hands. A heck of a fine woodworker, Ian has also done timber framing and straw-bale and cobb construction. A team member since 2012, Ian is known for his keen attention to detail and creative problem solving. When Ian is not building, he is likely coaching or playing rugby, his lifelong love. Devin's first treehouse building experience came from building his own three-story home in the trees where he lived for many years. He thoroughly enjoyed the building process and the happiness his project brought to everyone who saw it. Somehow, it seems really difficult for people to be in a bad mood around a treehouse. Perhaps it is because of the playful mystery associated with treehouse living? Once, Devin spent his time traveling around the world and living in a treehouse of his own. Now he enjoys helping create castles in the sky for others. Read Devin's Staff Spotlight here. McKenna helms our web and social media presence, creating strategic content for our manifold channels. She developed and manages all aspects of the website you're currently visiting (thanks for stopping by!). McKenna also photographs our treehouses and products, designs marketing materials (like our rad email newsletters), and pens daily social media posts. McKenna hails from sunny Colorado and likes the quote: "It's when you don't hear the bats, that the bats are coming." Chica came home with the Nelsons after their year in Spain. She does not speak English, and for the most part rules the house. Chica adores Pete and is happiest when he is home. His Christian name is Fernando, after the bull who preferred smelling flowers to fighting. He goes by Nando for short. He enjoys cured pepperoni, saw dust piles, good conversation and chewing on furniture corners. We are hopeful he will grow out of the chewing and into chilling- it is a necessary quality to be on the NT&S dog crew. It takes a badass cat to be recognized in a crew of dog lovers. Fluffier than life, this cat lives to hunt, roam his kingdom of chickens and lounge in front of heaters. His friends call him by his name, his enemies don't call him anything because they are all dead. He is the most interesting cat in the world. A typical Nelson week would not be complete without a call regarding Vic's whereabouts. She is a wizard with the ball and prefers to take herself on walks. 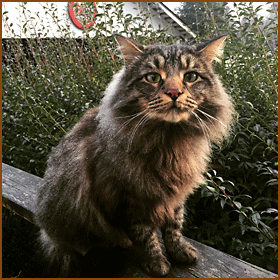 Zeus is a Savanna cat who loves exploring and bird watching. He's a major cuddler and fast learner. His best friend, Leo, is a Bengal cat who is also secretly a ninja and parkours all over the house. Leo also enjoys bird watching and hanging with dogs. Both cats answer to their names, and Zeus will even sit on command (he's bucking the trend of feline haughtiness). They love to travel and are constantly on the go—their dad, Geoff, takes them to treehouse builds around the country. Meet Frida, the newest addition to the Nelson family! Pete found Frida while building in Texas Hill Country. Pete has a pattern of falling for dogs on treehouse builds; Frida is the second Chihuahua Pete has brought home from a job site! Frida is the squirmiest cuddle bug in all the land. She likes to curl up on your lap, in your bed, on your chair—basically, wherever you happen to be—at all times. She sleeps under the covers at the foot of the bed, and enjoys chewing on flip flops and pillows. While occasionally awkward in her movements, Frida can execute some seriously high hops!